That’s why no one expected an adventure game like The Walking Dead, a point-and-click adventure from Telltale Games that requires only a handful of hours to finish and requires players to shoot nothing beyond a handful of zombies, to win critical praise from nearly every media outlet in the business. It even won Game of the Year during the 2012 Spike Video Game Awards, beating out big-budget titles like Call of Duty: Black Ops 2. Clearly, adventure games are far from dead; instead, this classic genre that defined early PC gaming is finding a second wind and a new audience hungry for a story-driven experience. It’s a good time to look back and remember why adventure games failed in the first place, then talk to some experienced PC game designers about what’s next for the genre in the wake of The Walking Dead’s surprising success. But in the last few years a new breed of adventure game evolved across PCs, home consoles and tablets, bringing a fresh take on the genre that’s attracting a fresh audience. 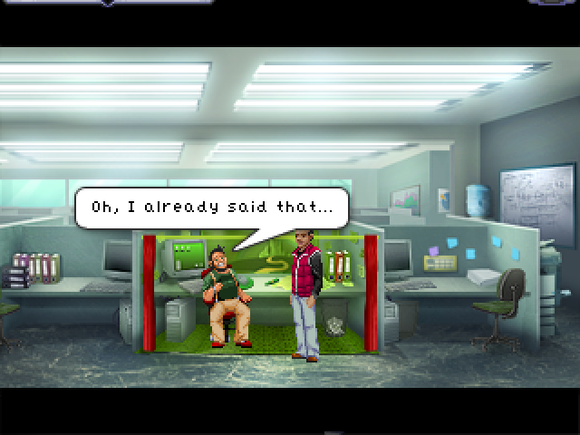 Companies such as Wadjet Eye Games, Phoenix Online Studios, and Telltale Games look to bring back adventure gaming to its former glory by using new technological tricks and telling some heartfelt stories most games can’t touch. To understand why, I contacted some of the leading voices in adventure gaming to understand what’s driving adventure gaming today. Everyone had different opinions, but one thing all agreed on was that adventure games can tell powerful, affecting stories with strong characters, and it’s that strength which draws in new fans. Cesar Bittar, CEO of Phoenix Online, brings up how the design of the adventure genre allows for flexibility in storytelling. But it’s not just great writing that’s bringing adventure games back; these games force players to make difficult decisions about how their games play out. Bittar notes that uneasy choices in adventure games “force you to make a really hard decision, and ramp up the emotional connection to the story in ways I have not experienced before.” Meaningful choices put the player right into the story and allows them to interact with a fictional world in ways no other medium allows. Already, there’s a new world of adventure games coming from both smaller companies and veterans in the business that are looking to return to a more story-driven approach to gaming. If you aren’t paying attention you’ll miss the growth of a genre where new voices can rise to the top to reach out to an audience that’s probably never thought about picking up a controller. And with a wider audience, developers can start exploring different story genres such as romance, comedy, erotica, or even tackling bigger issues through the gaming landscape. It’s happening right now, as a new generation tackles game storytelling on PC with free tools like the Twine game engine. More analogous to interactive fiction but not too far from early adventure games, Twine allows users to create their own text-based adventures that players can navigate via hyperlinks. When asked about the future of adventure games, most of the developers just wanted to see it continue to flourish, though how is anyone’s guess: Gilbert advocates the need for adventure games to “move forward everywhere” while Bittar sees the advancement coming from technology, specifically virtual reality, where we can further immerse ourselves in the worlds they create. The most important thing to learn from the adventure game revival is that developers aren’t taking it for granted; they’re learning lessons from how adventure games died back in the ’90s, and every developer I spoke to wants to prove that The Walking Dead isn’t some outlier of the genre, but the start of a greater adventure ahead.